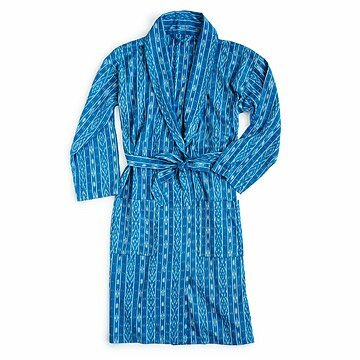 Wrap yourself in tradition as you wrap yourself in comfort with this soft, 100% cotton robe. Just because it's loungewear doesn't mean it can't be as daring as the rest of your haberdashery. Wrap yourself in tradition as you wrap yourself in comfort with this soft, 100% cotton robe featuring an eye-catching ikat weave. One of the oldest and most cross-cultural methods of textile decoration, ikat is a type of yarn-dyeing that produces patterns celebrating the warp and weft of the fabric itself. Don this cotton robe when you're looking forward to a lazy Sunday morning or an effortless evening in. Made in India. Machine wash, gentle cycle, cold water, no bleach. My fiance uses this robe in the mornings and evenings when he wants to relax. I looked everything, both in retail stores and online. This is the only robe we found that was not boring. The fabric has a wonderful colorful design. Bought this for my husband for Christmas as he didn't have a robe. Turns out he would have preferred a fluffier, terry robe like I have - but he still likes this one fine. The color is very nice and it's perfect for him to throw on to let the dogs out, or to investigate a noise in the middle of the night. The quality is that of a much more expensive brand. This is a well made light weight robe that was a birthday gift for my son living in Austin. It's a finer weave than the Guatemalan Ikat I am familiar with so I am hoping it will last well. The sleeves are too long for him...eh's 6'3" so I will shorten them. Otherwise, we are both happy with the purchase. Great robe for warm days. Love the material feel, look and texture. Looks great on my husband. It is now his go to robe.